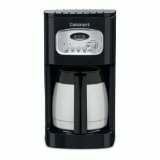 This Cuisinart coffeemaker is a 10 cup, programmable 24 hour unit. You can also choose a setting of one to 4 cups if you want a smaller quantity with the same quality. Has most of the same features as other Cuisinart's from the pause brew function, automatic shut off after brewing is completed, gold tone permanent filter, charcoal water filter, and a double walled insulated thermal carafe. Unit comes with the standard three year warranty. Weighs 8 pounds and measures 13 inches high, 9 inches in length, and 8 inches in depth. The carafe provides dripless pouring and a stay cool handle. Customer reviews are mixed with the majority giving it a 4 star rating out of five stars. Depending on where you purchase the Cuisenart DCC-1150 Thermal 10-Cup Programmable Coffee Maker you may or may not have the gold tone permanent filter included with the unit. It is available separately. Cuisinart DCC-1150 PROS: Customers like the fact that once brewing is completed the unit beeps about 4 or 5 times. Also, the coffee stays fresh for up to four hours after brewing, no burnt taste. The carafe saves on electricity costs because it is thermal. Something to think of in this time of stress. You have the option of using paper filters or the permanent gold tone filter. Has a convenient and easily readable water level gauge on the right side of the unit. Cuisinart DCC-1150 CONS: Some customers might get annoyed at the 4 or 5 beeps informing you that the brewing is completed. However, personally I am slightly deaf and the extra beeps would be appreciated. The carafe may get clogged if not cleaned after each brew, causing the coffee to spill all over the counter. This is a difficult machine for left handed people such as myself in that the water is poured in from the right side of the machine. If you want to empty the carafe completely of coffee you need to remove the lid and tilt the carafe to an extreme angle. Also, the carafe pours slowly, but this is because it is a thermal carafe. One reviewer complained about the coffee being weak.